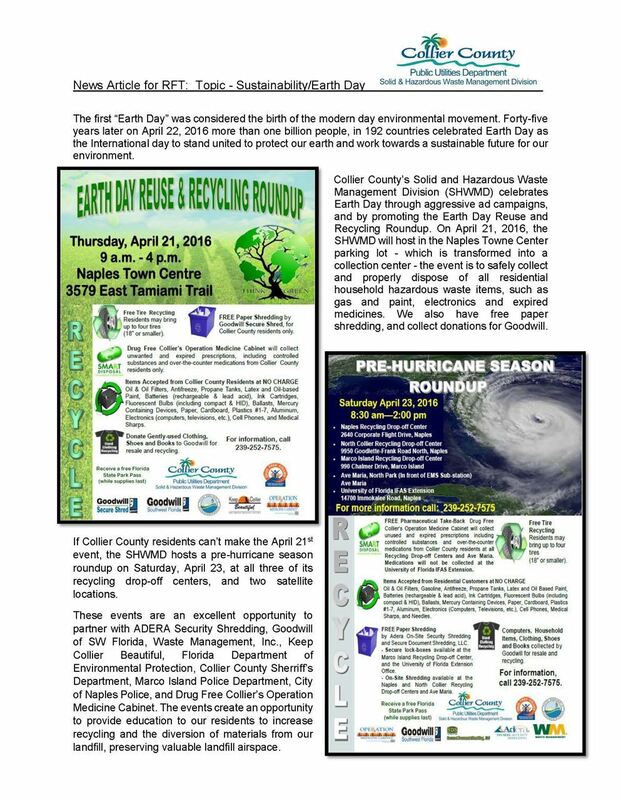 Celebrate Earth Day 2016 | Recycle Florida Today, Inc.
Join in and see how some of our members are celebrating Earth Day 2016! go to link thesis writing jobs Marion County, FL – Larry S.
Come join us on Saturday, April 23rd, from 9:00 am to 3:00 pm, for the Ocala National Forest cleanup event; safeguarding the Ocala Wildlife Management Area of unwanted and unsolicited trash. You can register for this event by calling the FWC’s Regional Office at (352)-732-1225. Additional information and updates will be emailed to you. We’ll start at the US Forest Service office on SR 40, or you and your group can start at an alternate location. The trash drop off locations will be sent out closer to the time of the event. *If you’re required to complete volunteer hours for your school or club, this will be a great way to earn those hours. Established in 1908, the Ocala National Forest spans 673 square miles and hosts numerous recreational opportunities for the public. A mainstay for many generations, this effort will enhance the land and help perpetuate the outdoor tradition of recreation in the Ocala National Forest. Help keep your land safe and clean. The City of Key West and Keep Key West Beautiful are hosting Earth Day’s Great American Clean Up! Heather A. book on how to write an essay – Recycle Florida Today, Inc. Visiting the Villages Environmental Club for their Earth Day Celebration on Friday, April 22, 2016, at Lake Sumter Landing in The Villages, FL. Join us for the Annual SWA Soiree<http://www.swa.org/soiree> on Saturday, April 2, from 9 a.m. to 2 p.m. The SWA Soiree and Run AWAY 5K Trail Run will demonstrate that it takes us all to do our part to Reduce, Reuse, Recycle and Rethink! for a sustainable future. Proceeds from the event will benefit Rebuilding Together of the Palm Beaches and Resource Depot. source Run AWAY 5K Trail Run/Walk – 7:30 a.m., rain or shine. More than 200 runners are expected to greet the early morning with a trail run/walk over 3.1 miles of the Solid Waste Authority of Palm Beach County’s Greenway Trail System and Grassy Waters Preserve’s Owahee Trail. An awards ceremony starts at 9 a.m. There is a 300 runner maximum. Registration is online. Soiree – SWA Administration, 7501 N. Jog Road in West Palm Beach from 9 a.m. to 2 p.m., rain or shine. More than 50 Exhibitors from all industries will showcase how they are doing their part to Reduce, Reuse, Recycle and Rethink! Another 10 Exhibitors are expected for the Kids Corner. Four food trucks will offer lunch. In the auditorium, a Recycled Fashions Showcase will feature student designs on the catwalk. https://www.solar1.org/dissertation-analysis-chapter-2620/ FREE Shred – SWA Landfill, 6890 N. Jog Road in West Palm Beach from 9 a.m. to 2 p.m., rain or shine. Palm Beach County residents can drop off up to 6 boxes of personal documents to be shredded for FREE by Shred Trust. For safety reasons, no participant will be allowed to get out of their car and watch their documents being shredded. New or replacement Blue and Yellow recycling bins will be available for pick up. Remember, pollution prevention starts at home. Visit www.SWA.org/HCRC or call 561-697-2700 or 866-SWA-INFO (toll-free) to learn more about the Solid Waste Authority’s Home Chemical and Recycling Facilities. Learn more about the SWA Soiree and Run AWAY 5K Trail Run online.